Once limited to the Security module, routes have come into their own! Expanded for use with both dispatching and non-dispatching environments routes allow you to define a series of checkpoints, either project-based or location-based and apply the results to either security, delivery, or service actions. Mobile users can then be directed from one checkpoint to the next as they complete their work. Exceptions can be built around checkpoints being out of order or taking too long. Work on a route can even automatically generate labor records for employees if desired. 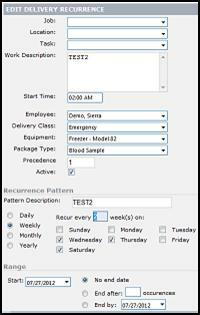 Expanding off our successful launch of recurring labor events we’re introducing controls for recurring delivery events. Now you can define specific delivery events, including delivery classes, package types, and equipment and attach these to defined patterns such as every other day, every Monday, once a month on the 15th, etc. You can even pre-define the employee who should be assigned if you wish. These recurring deliveries are part of the delivery dispatch system and can be automatically created each night before they become due.